Happy Olympics everyone! As a sports enthusiast (most notably a lifelong Yankee fan, played first base in synagogue little league and former Rosh Sport one month one summer at Camp Moshava, Wild Rose) I am super excited about the Olympics! Once every four years, (don't give me that "Winter Olympics" nonsense- if it's not figure skating or my bizarre addiction to curling, I'm not that interested) you can put politics and regional squabbles aside, and the whole country rallies around "their team." And for my whole life, that was Team USA. This is the first year, while tangentially following and rooting for the Americans, I am actively cheering for a new country- Team Israel! Rooting for Team Israel after being an American fan for many years is like rooting for the underdog of all underdogs, after rooting for the 10-time world champions your whole life. There is an edge to it, an urgency, that I've never felt. When you root for Team USA, you root for the top of the medal count, when you root for Team Israel, you root for a medal. 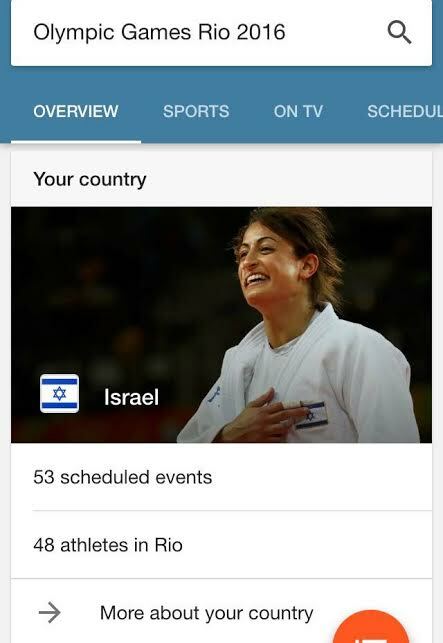 See, Team Israel has won single-digit medals in its history. We have yet to win more than 10 medals! But does that dampen my excitement? No way! 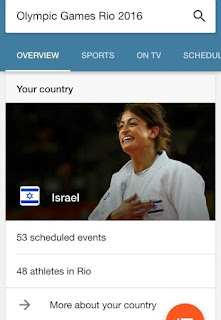 This year, Team Israel sent its largest-ever delegation- 47 Olympians! Team USA has 554, and I'm no mathematician, but that seems to give Team Israel a much smaller opportunity to bring one home. We also compete in competitions I would have never thought to follow. Long gone are the days of screaming for the Dream Team in basketball and the Fab 5 in women's gymnastics. Now I'm all about rhythmic gymnastics, windsurfing and judo! Did I have to google "what is judo?" Maybe. But now that I know, I'm all in! The big story is how the Arab world is treating Israeli Olympians. It is a big story to people who are not me, because I am a right-wing extremist who doesn't feign outrage when the Arab world insults and derides Jews. But that's just me. Am I disgusted that Lebanese athletes tried to block Israelis from boarding a bus back from training? Of course! Am I surprised? Nope. Am I horrified that a Saudi judo athlete has apparently taken herself out of competition in order to avoid an Israeli competitor? Quite the contrary! If they want to show the world that they don't care about fulfilling lifelong dreams all in the name of bigotry- go for it! And a forfeit is a win for the Israelis, so let 'em all forfeit, for all I care! That's one step closer to the gold! This is not to say I'm not super- proud of Team USA. They are killing it out there, and I am as obsessed with my Jewish-gymnast sister Aly Raisman as can be! I love that they are leading the world, bringing a politically- fractured country together for just a little bit, and representing my second-favorite country so beautifully. But for now, I cheer on my blue-and-white clad countrymen, follow the local news with anticipation and take intense pride in the newest Israeli medalist, Yarden Gerbi (name twins!) I put in an extra little prayer for another medal or 2 (hey, can't hurt) and yes, check out Team USA on top of the medal count with a flutter of pride. Because you can cheer on your two countries, you know. Just as long as if they ever compete head-to-head, you take a stand. And my stand will always be Yalla Yisrael!